Strengthening families and supporting the stay of children in their families should be the task of the social protection system in Serbia, says Opening Doors campaign coordinator in Serbia the Network of Organizations for Children of Serbia – MODS. To discuss how to prevent separation of children from their families and to ensure permanent, timely and adequate support to families with children, the Network of Organizations for Children of Serbia – MODS organized a conference “Strengthening Families – Windows of Opportunity” which took place on 25 September 2018 in Belgrade. The conference was held in cooperation with the Republic Institute for Social Protection and UNICEF, under the auspices of the Ministry of Labour, Employment, Veterans’ and Social Affairs. Speakers included the Minister of Labour, Employment, Veterans’ and Social Affairs Nenad Nerić, Deputy Director of UNICEF in Serbia Severin Leonardi, Professor of the Faculty of Political Sciences Nevenka Žegarac and MODS Director Saša Stefanović. Conference discussions were shaped around a number of possibilities and resources which already exist in the public and civil sectors but need to be put in place to ensure strengthening families and supporting the stay of children in their families. State Secretary Nenad Nerić emphasized that the protection of a child, his or her best interests, and, therefore, a family, is one of the basic tasks of the social protection system. He added that the system of social protection in Serbia is shifting from restrictive measures towards supporting biological families and that it is important to give enough attention to measures that facilitate faster reunification of children with their biological families. Severin Leonardi, Deputy Director of UNICEF in Serbia commended the Government’s efforts to prioritise family support. She noted, however, that “family support services are not available to all families and parents yet”. Ms Leonardi urged the Ministry of Labour, Employment, Veterans’ and Social Affairs to take additional steps “to establish a system that is effective in identifying families facing difficult life circumstances and making support services available throughout the country”. Speaking to conference participants, Saša Stefanović, Director of MODS, reminded that from 2009 until now, only 23% of children returned to their biological families out of the total number of children who left institutional care and that it is necessary to ensure their return to the biological families or prevent their removal as a priority. In her presentation, Professor Nevenka Žegarac pointed out the responsibility of a state to support parents and families in fulfilling their duties towards children. According to the UN Convention on the Rights of the Child, family environment is an important guarantor of the rights of the child as it provides protection and care. Despite this fact, states provide modest resources and mechanisms for supporting the family, she noted. It is necessary to support the paradigm shift of the social welfare system from restrictive measures towards measures that support families by developing a continuum of services aimed at families with multiple and complex needs, ranging from preventive to intensive services. Simultaneously with developing new services in the community or strengthening the existing ones, it is necessary to transform large residential institutions. This requires development of the transformation plans for the institutions and more efficient monitoring of the violations of children’s rights in those institutions. To ensure more efficient support to families with children, it is necessary to provide a mechanism through which local authorities shall have a well rounded and integral system of support to children and families which shall encompass: early recognition of difficulties and problems in children, early intervention as support to children and families at an early age, development of services that will enable constant, timely and adequate support to families with numerous and complex needs, both to families in crisis and to families having children with developmental problems. The Law on Social Protection should explicitly recognize measures that support families, especially those in crisis situation or at risk of separation, and to ensure reunification of children with their biological families. The Law on Social Protection should stipulate that decisions on children’s placements in institutional care are audited and revised every two months. After two months, the extension of such placements should require consent from the Government. It is necessary to make professional procedures and proceedings uniform through learning from good practice examples in work with children removed from their families. Good practice examples show that it is possible to raise the quality of work with parents in accommodation and strengthen the ties between family members, regardless of the child being in the residential accommodation or in a foster family, and encouraging a rapid return to the family wherever the return is possible. 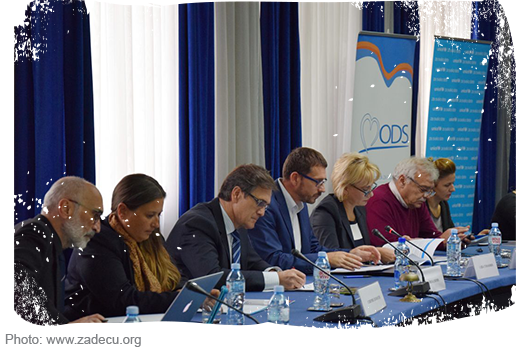 In 2017, the Opening Doors national Coordinator reported a number of challenges that stall progress with the child protection system reform in Serbia. Last year, two working groups on intensive family support services and on the transformation of institutions have been established by the Ministry of Labour, Employment, Veteran and Social Affairs in cooperation with civil society. However, due to the lack of a deinstitutionalisation strategy, there is no priority or focus given to end institutional care for children.